I got a sweet PC addition in the mail today from my friend Joey (@beantownbreaks) from Instagram. He specifically picked this Nolan Reimold for me because we had agreed to a trade a while back for a card he was scheduled to get in, but the guy he was getting it from never sent. So, I have been holding the stuff he was interested in, in hopes that he could find something else comparable for trade. He finally got a piece when he found this 21/25 Reimold that I needed for my collection. I already have the refractor and blue autographs, and now I have this red parallel. 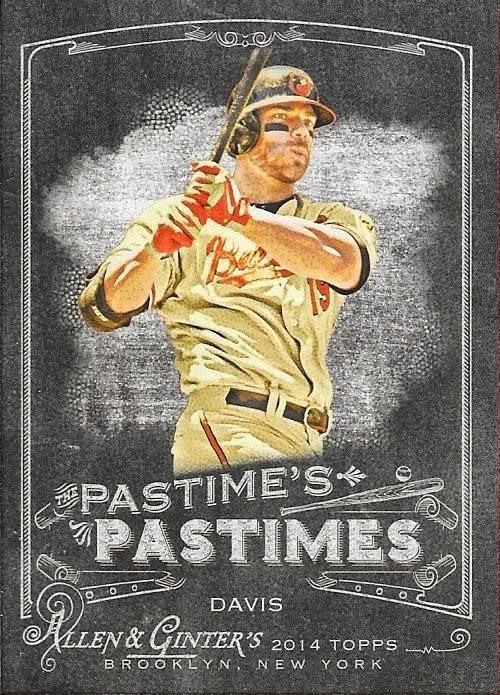 The gold parallels have been selling for ridiculous prices, so I doubt I will see one of those any time soon. I'm just glad to have the red out of the way. Thanks for the deal, Joey. I plan on shipping to you tomorrow. I got a nice surprise package in the mail today from my friend, Michael A., from Instagram. We chat almost every day about baseball and I try to send him Justin Upton and assorted Diamondbacks cards when I can. Recently, I sent him a decent-sized stack of Randy Johnson cards and as a thank you, he sent me this really cool Roberto Alomar manufactured patch card. 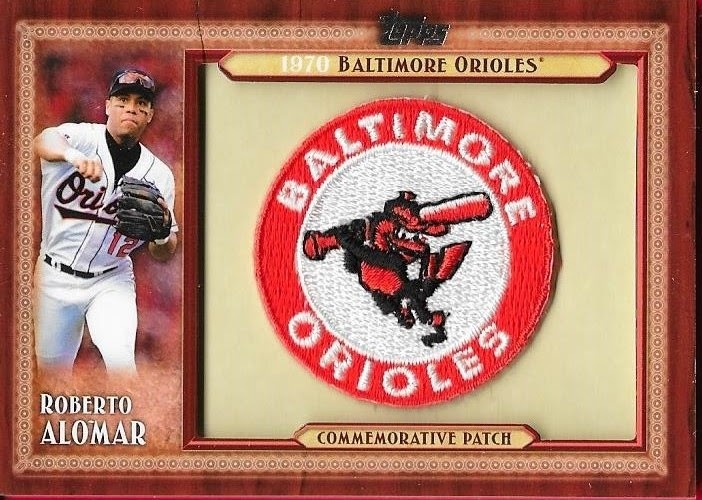 I like this patch on the card because it is the O's logo from when I started out as a fan. I don't have a lot of Alomar hits in my collection, so this will be a nice addition. Thanks so much for the card and letter, Michael! Rarely do I use my blog to tout the collections of others, but today is an exception. My buddy, Jet, has completed the 1954 Topps set. The last card he needed was Johnny Sain and he just recently purchased it from Ebay, meaning that he now has in his posession, all 250 cards. This set is a dream set of mine. I love the design and the fact that there are legendary cards in the set. I took it upon myself this summer to help Jet realize his dream when I picked up something like 50-60 cards that he needed from a card shop in Detroit. For his birthday, I helped his mom pick out some key cards that he needed, namely the Jackie Robinson. This set consists of rookies of Hall of Famers Hank Aaron, Ernie Banks and Al Kaline. The Jackie Robinson is a "tough get." 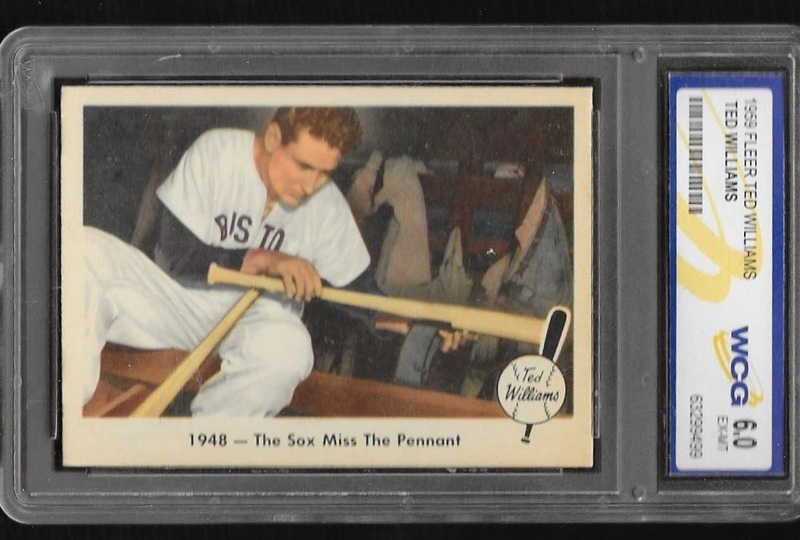 The fact that there are TWO Ted Williams cards that bookend the set also makes it a tough one. Jet has given me credit for helping him reach his goal, but in reality, I don't want any credit at all. The cards I sent were all part of a trade, I just helped facilitate getting him closer to his goal. I also mentored him through the process, and made a really good friend. I'm just really proud to see a young person, such as Jet, pick a difficult set to collate and stick with it. Jet is 14 and most kids his age believe that baseball doesn't exist outside of Mike Trout, Bryce Harper or Manny Machado. For someone like him to have a passion for set building and vintage cards really makes me feel good about the state of the hobby. I just wish more folks Jet's age felt the same. Congratulations on the accomplishment, buddy, you earned it. 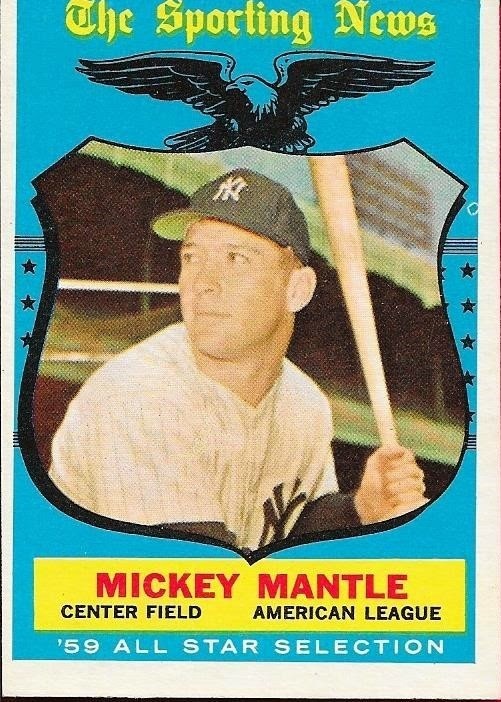 I knocked a huge need off of my 1959 set when I bought this Mickey Mantle All Star card off of Ebay the other day. The card came in the mail today and looks awesome. Other than being off center, it is in awesome shape. I have seen this card go for around $100 - $125, but I had been watching a couple that were in worse shape than this one that were Buy it Now for $55 and $57. I saw this one, which was listed as an auction, and caught it with about an hour to go. I bid my maximum bid at the $55 that I had almost been willing to spend on the BIN one and rode out the auction to win it at $42.00 shipped. AWESOME! So, this was the biggest remaining piece that I needed for the set. 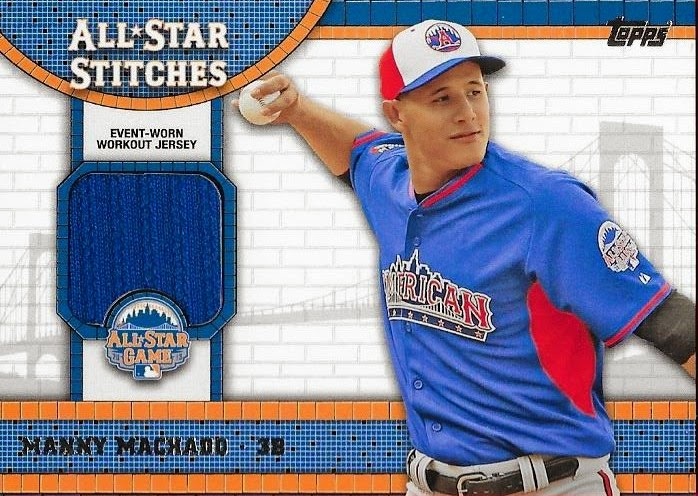 I still have a good many All Star/High Numbers to get, but none are as prestigious as this card. 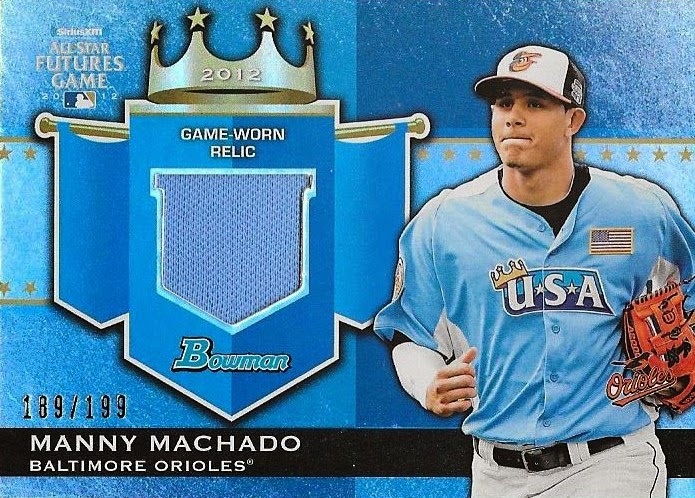 Mantle cards always seem to carry a premium. Even though I am in no way a Yankee fan, I still can appreciate the gravity of adding a new Mantle to my collection. This leaves me needing 98 cards to complete the set. 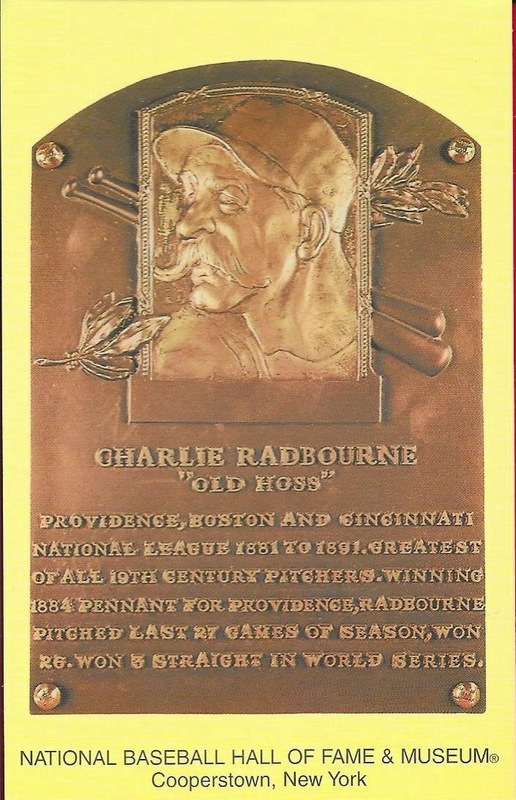 Historically, his last name has been spelled two ways, Radbourn and Radbourne. I have seen Radbourn used more and will use that spelling of it here. If you are active on the Twitter, you may know that the long-deceased Old Hoss Radbourn is very active on the account @OldHossRadbourn. Many humorous posts using the language mechanics of the late 19-th century makes his account a fun one to follow, especially when he rants on the merits (or lack thereof) of today's players. Radbourn (b. 1854 - d. 1897) was the son of a butcher who played in the majors from 1881 to 1891 (11 seasons) for the Providence Grays, Boston Beaneaters, Boston Reds and Cincinnati Reds. His career record was 309-194 with 1,830 strikeouts and an ERA of 2.68. Radbourn won an astounding 59 games in 1884 for the Grays in a time when a team's pitching rotation consisted of only two pitchers, with some players needed from time to time for spot starts. That season, Radbourn would start 73 games (and come in relief in two others, notching 2 saves) and complete all of them. That season, he would boast a record of 59-12 with a 1.38 ERA and would lead the Grays to a championship. It was a different game back then as the pitcher was expected to pitch the entire game. Throwing overhand was not allowed and there was no pitcher's mound. The pitcher would throw the ball from the pitcher's "box" and oftentimes would be able to get a running start before throwing a sort of sidearm delivery. Radbourn was widely considered the greatest pitcher of his day, but as one may be able to tell, the huge work load on his arm allowed for him to have only a brief career. Radbourn was elected to the Hall of Fame in 1939 by the "Old Timers Committee". His 309 wins rank 19th all-time. His career WAR (if anyone cares about that crap) is 76.0 and ranks 72nd all-time. His 448 career complete games rank 8th all-time, even though he only played 11 seasons. Radbourn also captured the pitching Triple Crown in 1884 with his 59 wins, 1.38 ERA and 441 strike outs. Radbourn is one of the several players that I know I will not own an autograph of, since he passed away in 1897, and it is highly unlikely any baseballs signed by him exist. I got a package of Orioles cards last week from my buddy Drew who operates under the name of @ultimatecards_ on Instagram. He, like my other friend, Drew, is a huge Yankee fan. It is only a matter of time before I get the two Drews mixed up. Anyway, Drew gave me a bunch of Orioles. One of which is the above Nelson Cruz from 2014 Chrome, and I actually needed it for my set! That reminds me, I need to post my needs list for 2014 Chrome and 2014 Update on my wishlist page. Hold your breath! Another cool card in the stack was this Chris Davis from Allen & Ginter. I don't believe I had this yet, but I need to double check. 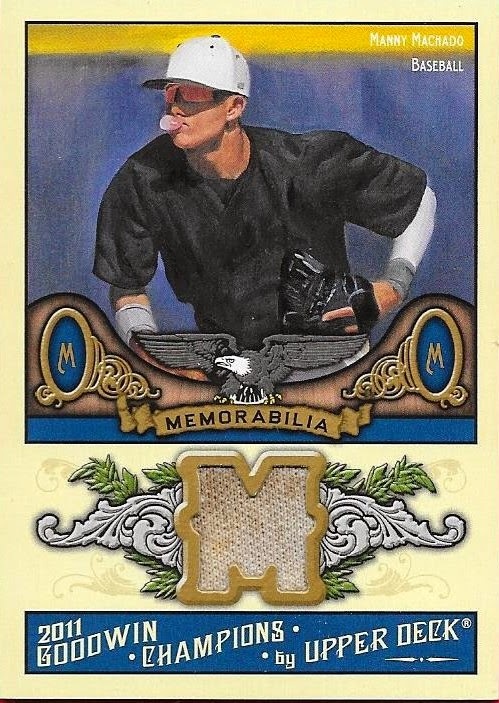 I'm pretty sure I hadn't picked it up, since I didn't get a whole lot of Ginter this year. Thanks so much for the cards, Drew! This officially catches me up on all of my recent trades and purchases. Unless something comes in the mail tomorrow, I will be scrambling for something to write about. I doubt I will have too many problems, though, I can always think of something to write about. 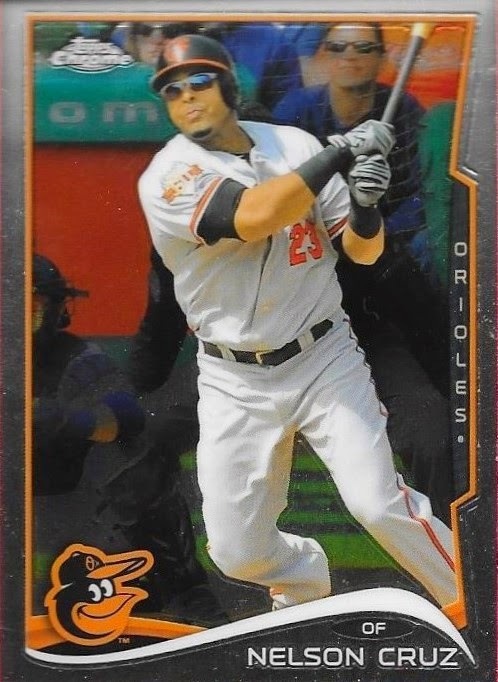 As I continue meeting new people on Instagram, I have been able to relieve myself of quite a few cards and pick up some good Orioles in the process. 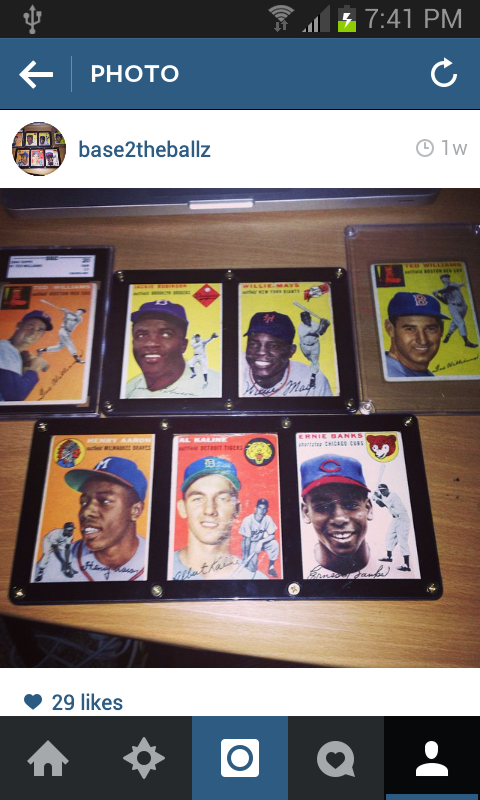 I met a guy on Instagram (his screen name is @whitesoxfan79) who is a Paul Konerko and White Sox collector. I was able to send him a 200ct box full of Konerkos and White Sox, which, according to Anthony, was really awesome. I got a bunch of Orioles from Anthony, including the above oversized 2000 Topps Cal Ripken. I'm pretty sure I didn't have it already. Even if I did, I really like the card. I don't remember much about building that sat, to be honest. I know I have it and I know it is completed. I might ought to look through it sometime and check out the rookies, Hall of Famers, etc. That is one of my favorite parts of looking at old sets, seeing the big names that were around at that time. 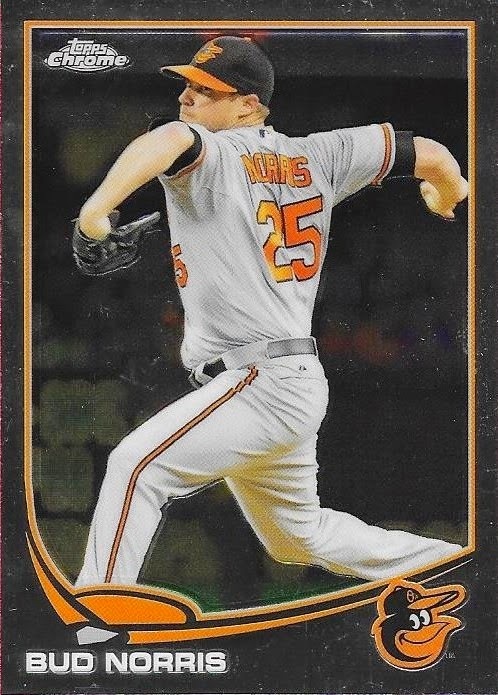 Another card that was in the package was this Bud Norris chrome from 2013 Update. I felt like Norris did a great job this season, even though he was less than stellar in his ALCS start against the Royals. He did very well against the Tigers in the ALDS and I think he will only build off of this season and be even more successful next year. If that's the case, then the Orioles should be in good shape. Thanks for the trade, Anthony! My good friend Max sent me a couple more packages recently and these were slammed full of awesome stuff. He sent me 4 Orioles signed post cards. 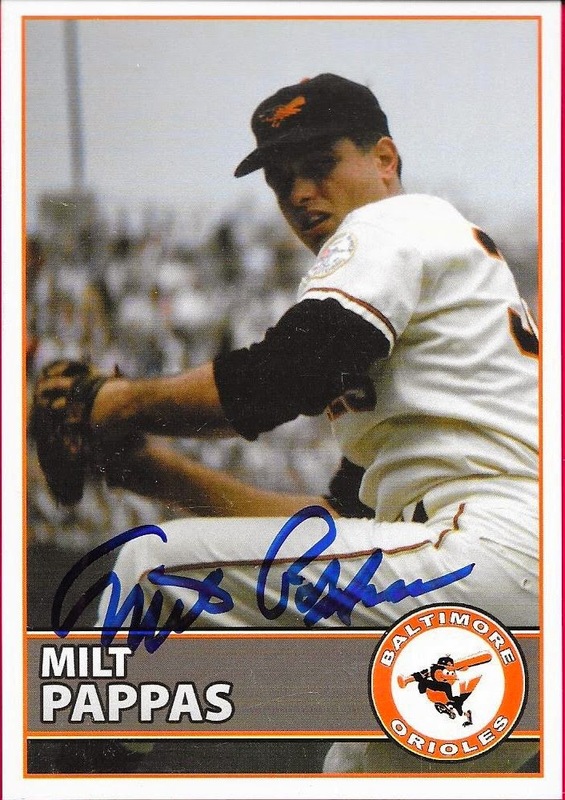 Among them was this Milt Pappas. Pappas was most remembered for being the piece that brought Frank Robinson to Baltimore. Other signed post cards Max sent were Al Bumbry, Chris Hoiles and Tippy Martinez. 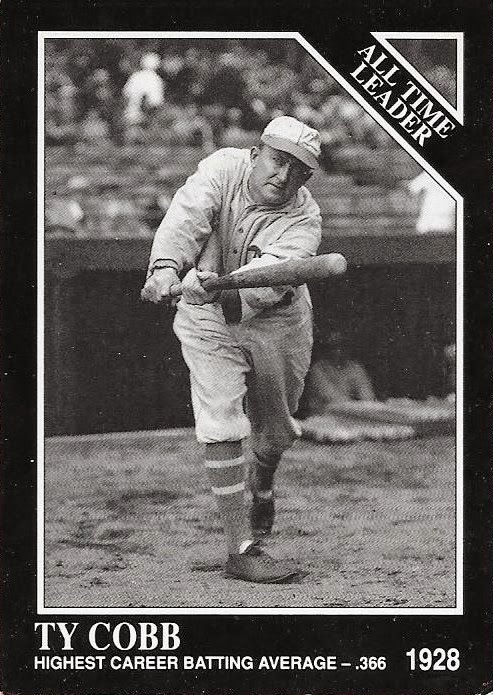 Max sent me several Conlon Collection cards, most notably this Ty Cobb. I have the complete set of these, which I picked up at the National a few years ago, but I'm always happy to accept more of them. They're always fun to look at, especially the players who weren't Hall of Famers that they included in the set. Speaking of Hall of Famers, Max added a bunch of random Hall of Famers inserts in his packages. 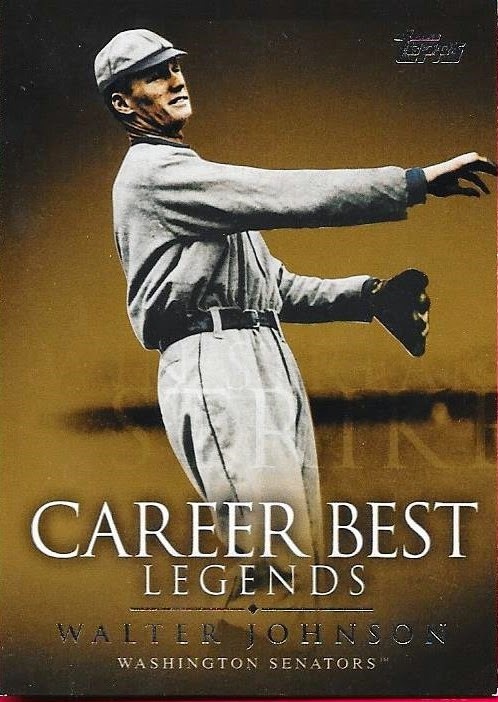 One of them was this 2009 Topps Career Best Legends Walter Johnson. I just talked with my buddy Andrew on Skype the other day about all-time great pitchers and Johnson was one of the ones who's stats we spent a lot of time analyzing. I need to record some of these discussions. They would make for great blog or Youtube posts. 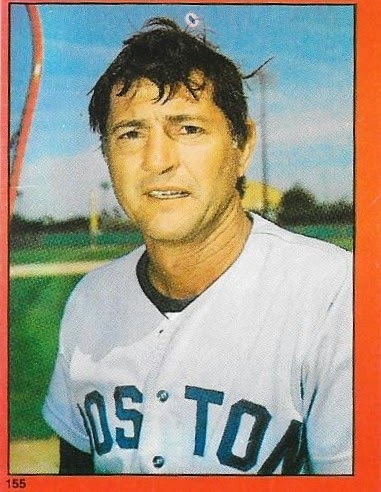 Finally, Max sent along some oddball stickers like this 1982 Topps Stickers Carl Yastrzemski. This is a pretty cool piece from later in Yaz's career that I had never seen before. Max is a realy awesome guy whom I've spent a lot of time getting to know recently. He's one of the best traders on Instagram, and one of the best all-around people that I've met. I'm certainly happy that I have been able to help him out with his collection, and I'm even happier that we have built a friendship from it. If you are on Instagram, I recommend you follow him, @graphinchitown. I picked up a jumbo box of 2014 Topps Update the other day from my local card shop. I felt like I did really well with what I got. 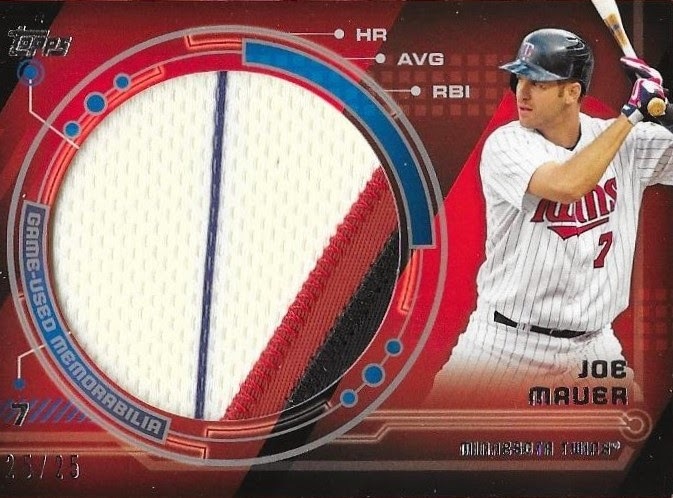 The above Joe Mauer jumbo patch card was in place of the manufactured patch card (I was really happy about that). This card is numbered 25/25. Like I said in a few earlier posts, I really like patch cards, so I think I'll hold onto this one. 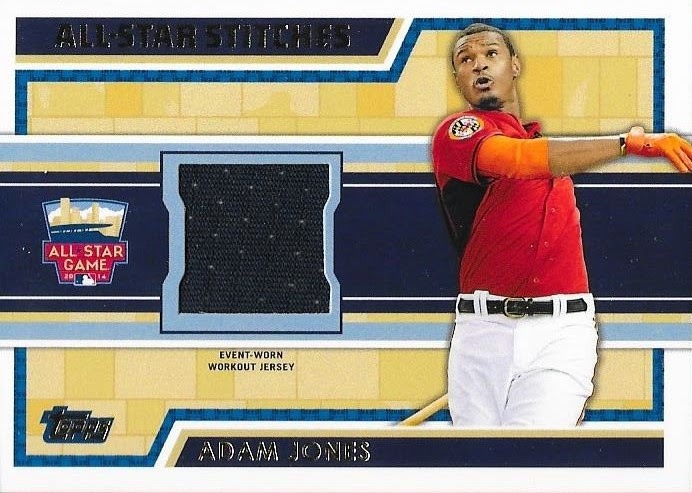 The All Star Stitches card was a PC item for me, this Adam Jones. That makes two recent boxes that I've gotten where my relic hit was Jones. Not bad! I also pulled a black parallel Jose Abreu All Star card and a Rougned Odor auto. I was able to collate most of the set, I lack only 5 cards. I will post them on my wishlist page shortly. I took out all of the rookie cards that I want to keep, all Orioles, and then other teams for friends of mine. I was left with a small stack of random base that I intend to sell. In all, I was very happy with my jumbo box of Update. I wasn't going to get a box this year, but decided that I would. I'm glad I did, because really, I do enjoy the Update set every year. I visited my good friend, Ryan a few months ago to see the Richmond Flying Squirrels play the Bowie Baysox. 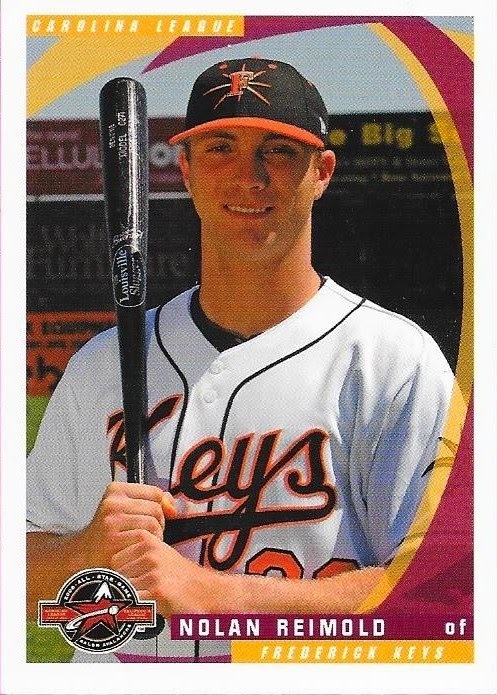 If you recall, this was the last game for Nolan Reimold in the Orioles organization and Ryan and I wanted to see Nolan before he was DFA'd. Nolan ended up with the Blue Jays, then the Diamondbacks. He is now a free agent and should be picked up by someone for next season. 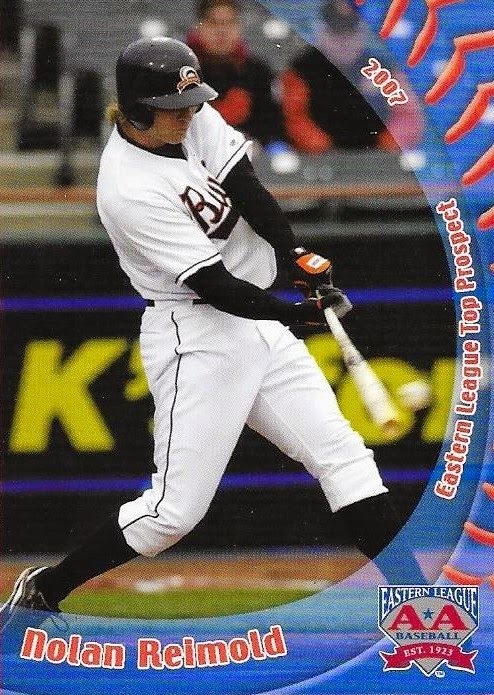 Ryan gave me a nice stack of O's cards when I visited and a bunch of them were minor league cards of Nolan. I didn't have any of them, so I was glad Ryan hooked me up. I hate that Nolan is no longer an Oriole, but I still am a fan and wish him well. I really hope he gets a nice contract with someone and can stay healthy. Ryan is a great guy and one of my best friends in the card community. We do a lot of things together, be it Fan Fest or going to different games. I know he was hurting as bad as I was when the Orioles were defeated in the ALCS by the Royals, but we both know that the O's will be back next year. I knew it was coming. I knew it when he was released by the Yankees earlier this season. Brian Roberts's playing days are over. After playing 14 seasons in the majors, Roberts has decided to hang up his spikes. This is a bit of a tough moment for me, because he was the first player I really got behind in the post-Cal days of my collecting. I had taken a sabbatical from collecting after 1996 and got back into it after seeing a game with a friend in 2005. Roberts hit a walk-off home run against the Yankees at that game and I was hooked again. When I got home from the trip, I immediately started buying up cards just so I could add Roberts to my collection. I have a pretty stout Roberts PC. I have: 1 Orioles jersey, 1 2005 All Star jersey (thanks Lisa! ), 2 signed baseballs, a signed bat and a ton of cards. Above, you can see his 2001 Donruss RC; Below is his final card, 2014 Topps (with the Yankees - uggh). Roberts closes his career of 14 seasons with 1,527 hits, 97 homers and a career average of .276. He hit 50 or more doubles three times in his career. 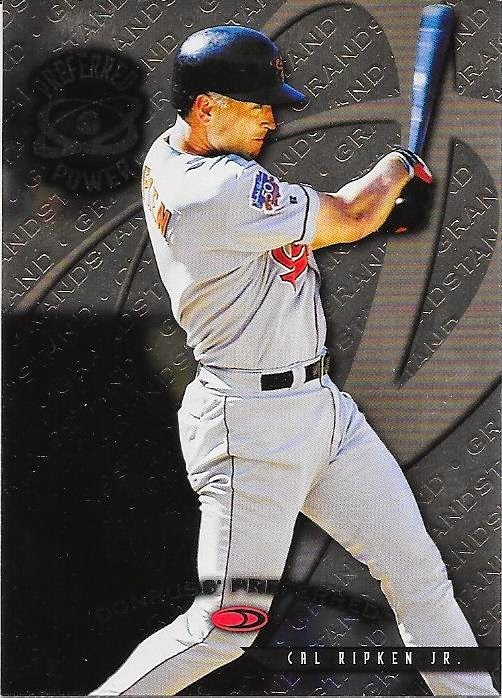 He finished as high as 18th in the AL MVP voting (2005) and was a 2-time All Star. Roberts won't get into the Hall of Fame, but he will get into the Orioles Hall of Fame. 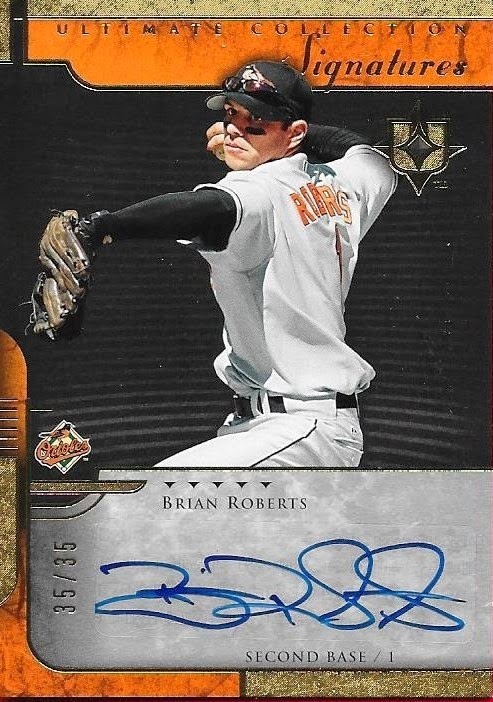 Roberts was the bright spot on several bad Orioles teams and I will miss him. He was a North Carolina native and always seemed to be pretty nice (although didn't say much) the few times I met him. I will retire his PC, but I do plan on filling in some gaps from time to time; mostly rainbow stuff. Maybe a relic or auto here and there. Thanks for the memories, Brian. I got a nice surprise package in the mail last week from my friend, Michael, who lives in Texas. He and I chat almost daily about all sorts of things and sometimes baseball. Michael had told me that he recently went through some boxes of cards from his childhood and came away with a bunch of Orioles that he wanted to send my way. In the package, Michael managed to include a couple Cals that I didn't yet have in my collection. 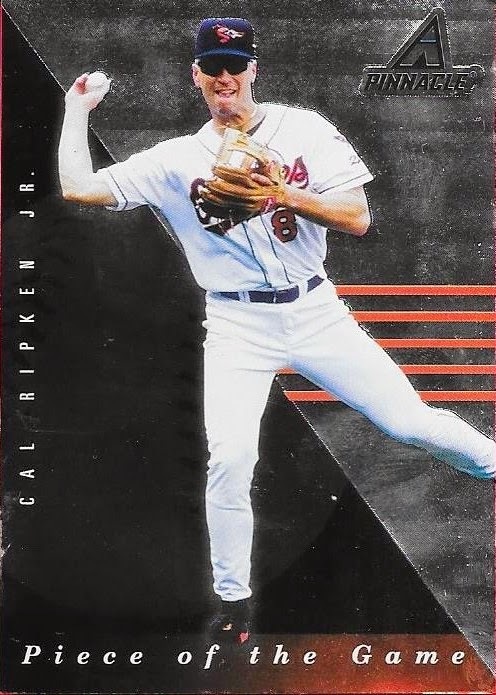 The above 1993 Upper Deck Fold Outs is a surprise, considering I was all over new Ripken cards back then. This one must have eluded me. 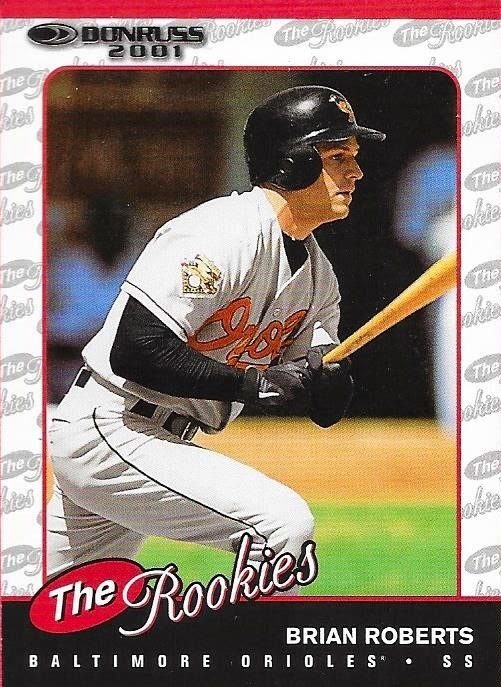 Another card I didn't have was this 1998 Pinnacle Piece of the Game Ripken. This one didn't scan nearly as good as it looks. 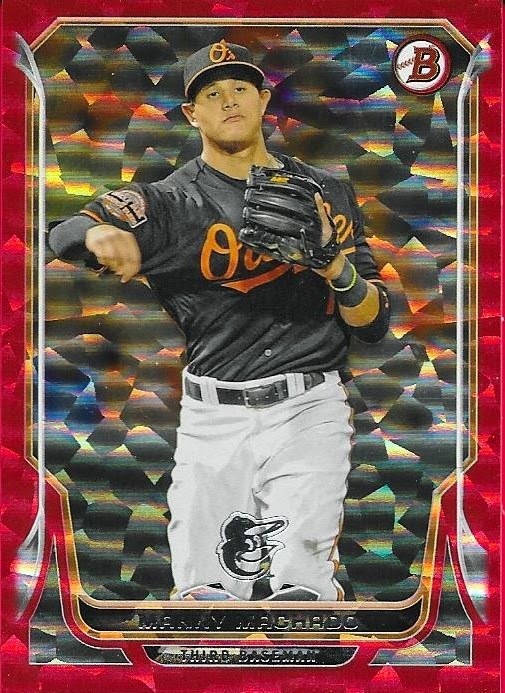 There is a ton of foil on the card, and my scanner doesn't pick it up well sometimes. Among the other cards in the package, Michael included some Hall of Famers and some Conlon Collection cards, always a favorite of mine. I came home today to an unexpected bubble mailer in my mailbox from Matt. I was blown away when I opened it up and saw these two autographed cards inside. The above dual auto came out of 2007 Upper Deck Exquisite and looks so sharp. I thought UD Exquisite and Ultimate were great high end products. I don't have too many Markakis autos, so this goes nicely into the PC. 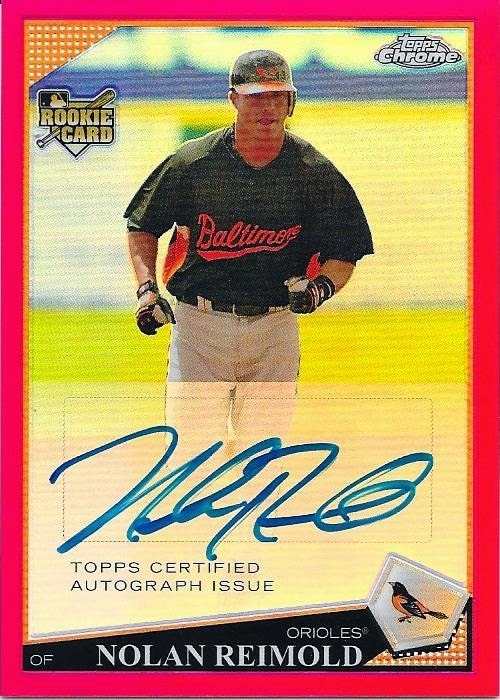 The Jon Knott auto actually looks really sweet, although Knott didn't last very long as an Oriole. 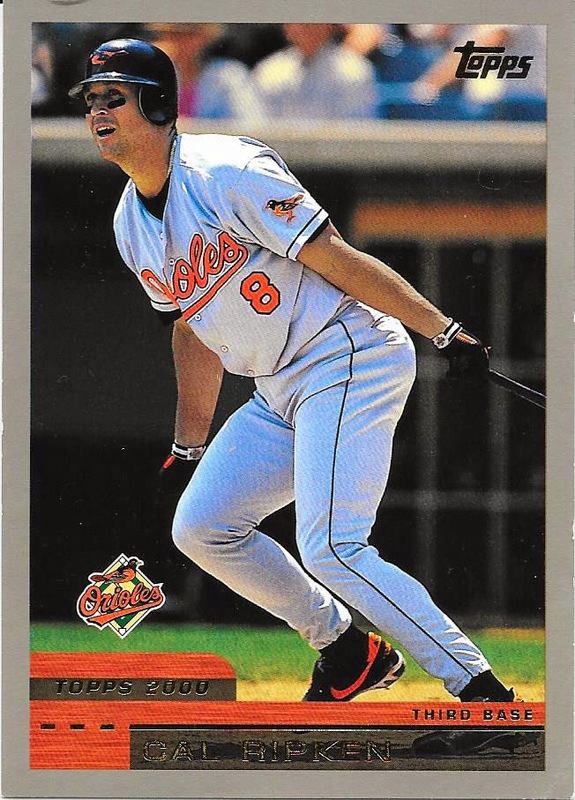 Knott played 7 games for the O's in 2007 where he had 3 hits, one home run and 4 RBIs. He wasn't seen in the majors after that. I remember when the O's picked him up. I remember hoping that he would pan out as a solid player, but it just wasn't meant to be. Matt also sent me this 2014 Panini Prizm Rick Dempsey auto. 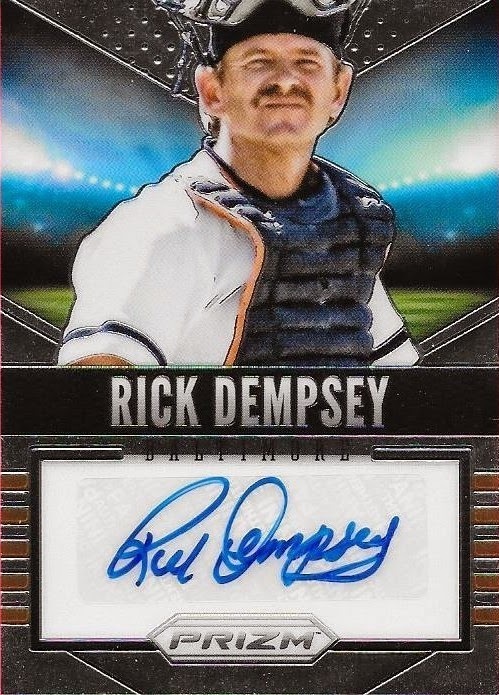 I didn't have a single Dempsey auto, so this was a welcome addition to my Orioles PC. Thanks so much for the cards, Matt! Please go check out his blog, Bob Walk The Plank. While I have been reminded today by coworkers, friends and family that baseball is just a game and that I should be happy that the Orioles made it to the ALCS for the first time since 1997, I must admit that I got greedy. Listening to all of the experts say that this could be the Orioles year to finally make it to the World Series for the first time since 1983, I bought into the notion that this really could be the year. I had purchased ALDS tickets and watched a magical comeback against the three headed monster Tigers rotation, sweeping that series. I told my friends that while the ALCS might go 7 games, I was confident that the Orioles could handle the Royals. I told a few friends that there was no way in hell the Royals would sweep, when the Orioles got down 0-2. Well, I was wrong. My team was just swept out of the ALCS by a young, hungry Royals team. I did not enjoy seeing the Royals players acting like high schoolers on the field with their celebrations after every hit; Jarrod Dyson's trash talking and Jeremy Guthrie's poor wardrobe choice. The only problem is, it's not bragging if you can back it up. The Royals brought a tough-to-defend game into the ALCS and simply beat the Orioles. The most frustrating part was the sheer luck involved in each Royals win. The series could have easily gone the Orioles' way, and I would be the one celebrating. However, I am not. I feel like I watched a friend pass away as the Orioles' 2014 season came to a close with a resounding thud. I choose not to remember the 2014 season by seeing my team on its deathbed, I will choose to remember the 2014 season as my son, my friend Ryan and I walked out of Camden Yards on October 3. Our throats hoarse from cheering on the Birds in that dramatic come from behind win. Camden Yards was more packed than I had ever seen it. Baseball is back in Baltimore. Fourteen straight years of losing appears to be in the rear view mirror. I am reminded that as good as we all felt as we walked out of that stadium several days ago, there were Tigers fans who felt the way that I do now. Remembering that feeling is the reason why folks who know me never see me brag or gloat about my team. This is why I appreciate Buck Showalter, because he always keeps an even keel and keeps things in perspective. But it hurts right now. It will hurt tomorrow. It will hurt during the World Series. It will hurt at Fan Fest in February and it will hurt come Opening Day, 2015, but I will get over it. As bad as I feel right now, there are Royals fans who have never seen their team play a single playoff game. Now, Royals fans, you get to see your team in the World Series. Congratulations. Maybe, one day, I will get my time in the sun, too. Until then, I won't be crying. I did that already. I remember saying last year that I wished I had more "sick" patches in my collection. A year later, I now have a ton. While I really don't like the term "sick" patch anyway (I mean, the patch didn't barf Ebola all over the card, now, did it? ), I do enjoy the patch relic and have decided in my mind that I enjoy them probably more than I do an auto. 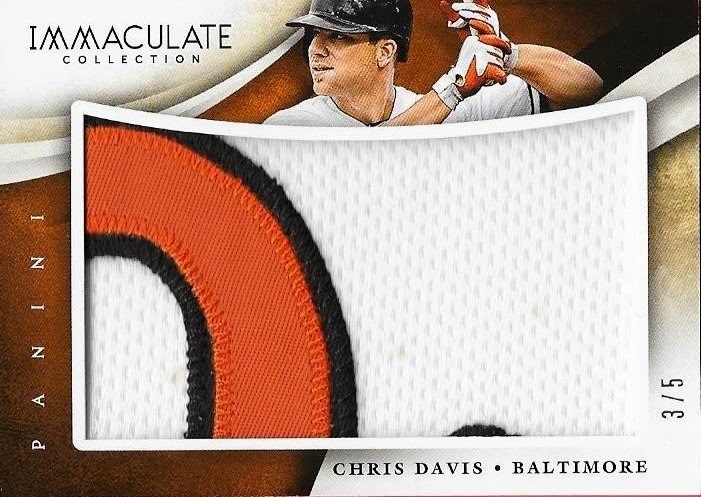 I saw this Chris Davis 2014 Panini Immaculate Collection patch on Ebay for $39.99 and jumped all over it. The card, as you can tell, is numbered 3/5 and looks awesome. It is hard to tell on the scan, but the jersey has a few faint dirt spots on it as well. Pretty cool. 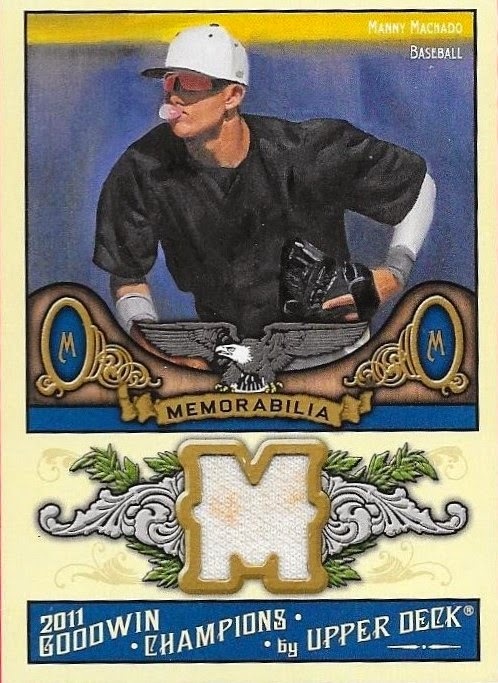 Between what I have seen from Immaculate, it looks like a really nice product (that I probably can't afford to buy), much like Museum Collection from Topps. I know how some folks like to bash card companies who put out this high priced stuff and how they are keeping the little man down, but hey, I'm ok with the loaded folks opening the product and offloading it to Ebay. I can search what I'm looking for and buy the card I want for a reasonable price instead of shelling out a couple hundred bucks on a box, only to get a Mark Prior relic. Jack, one of the Instagram kids that I talk to on a regular basis is a huge Royals fan. Because of that, he and I haven't really had a lot to say to each other this past week. No hard feelings or anything, but we both know the importance of this series and have left each other alone as the Royals have taken a 2-0 lead. Before the ALCS started, however, I got a nice care package in the mail from Jack that was a few days late because the USPS destroyed the PWE that he sent the package in. This is the third package I have gotten in the last two months that was wrecked. Two were trade packages and the third was a letter from my grandmother. I feel like the USPS has taken a nap with their QA/QC protocols lately. One of the casualties from this wrecked package was the above Adam Jones relic that Jack was nice enough to send. There is a bit of a crease just to the left of the Sweet Spot logo and the corners of the cutout for the relic are creased. This card took the brunt of the damage and really, it isn't too badly hurt. I think the only things that were really hurt were Jack's feelings. I assured him that it wasn't his fault and I still appreciated everything. 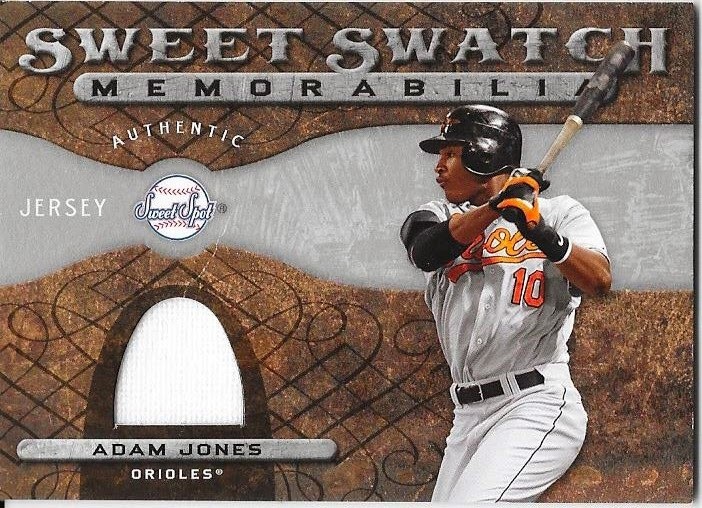 I do like the Jones relic card, and I didn't have one yet, so this one will fit nicely into the PC. 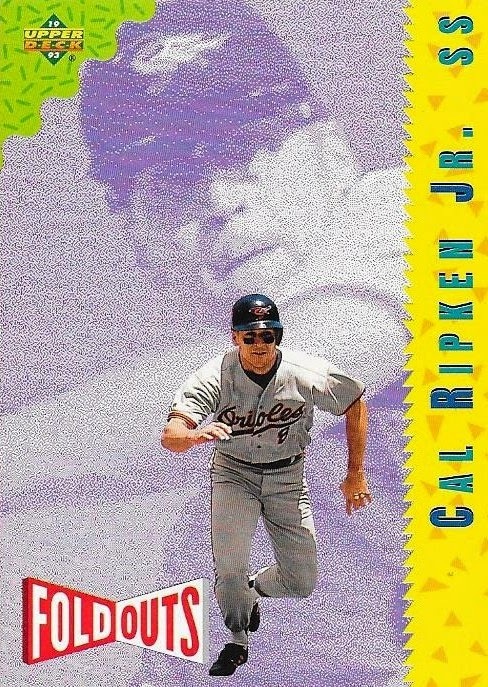 Jack also included this 1998 Donruss Preferred Cal Ripken that I don't recall ever seeing before. That bodes well for me, meaning that I might not have this in the Cal PC. Problem is, getting to the Cal cards, sorting them and seeing if I do, in fact have the card. One rainy day, sometime soon, I will catalog my Ripkens and will have some sort of a database. Here's to hoping. 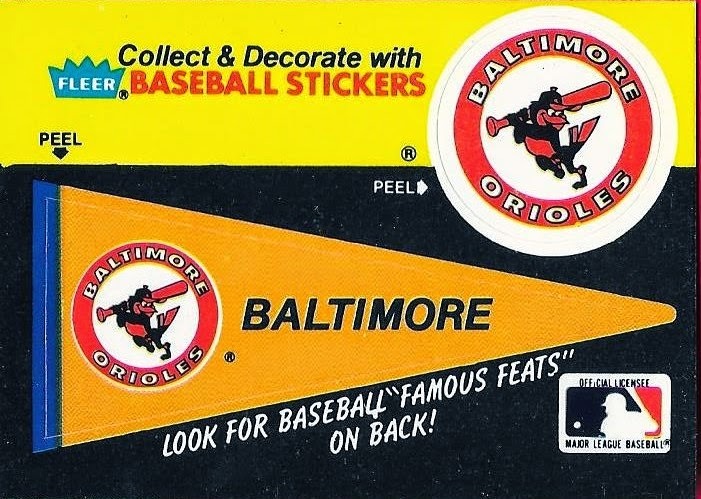 Speaking of hope, I hope the Orioles can mount a comeback. It isn't unfathomable that they could do it, just improbable. Stranger things have happened in baseball, though. Thanks for the cards, Jack, I really appreciate it. Like I said last night, I went back to my hometown for my birthday and made the rounds to visit some relatives while I was in town. I tried to remember to bring some trade bait for my older brother, John, because I keep forgetting and he always calls and reminds me. Apparently, I had some stuff that was good enough for his strict eye for condition, because we made a deal for a couple Orioles cards and a SP. 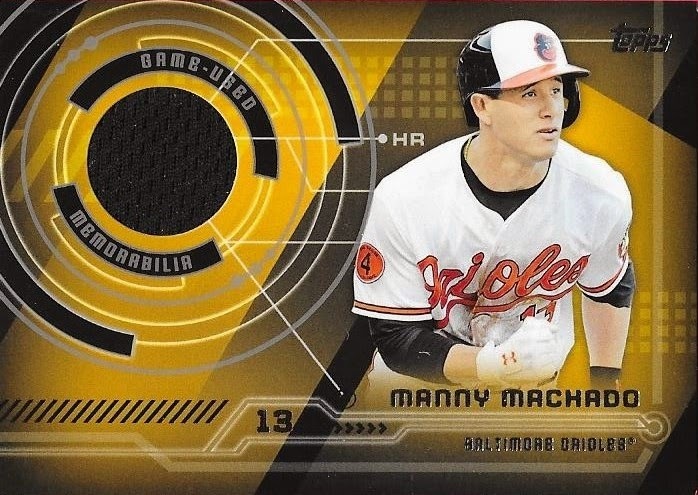 John priced the above Manny Machado X-Fractor RC pretty high, but I was able to talk him down into more realistic terms. He got some Red Sox stuff off of me, and I'm glad we were able to come to an agreement. He's a tough negotiator. 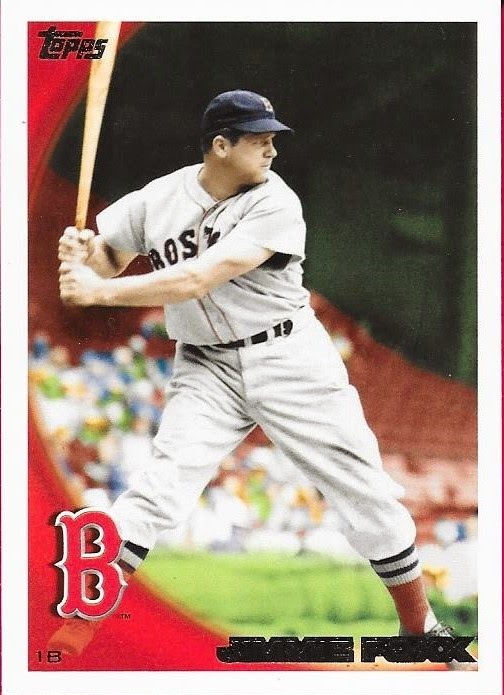 While I liked the Machado, this Jimmie Foxx SP was the jewel of the trade, in my opinion. I still enjoy the Topps legends SPs and I didn't yet have this Foxx for my PC. The value for these has come down and I probably could have gotten one for less than what I traded to get it, but I don't care. John was happy with the deal, and so am I. He knows I'm happy with it, because he asked me three or four times. Since it appears that the Kansas City Royals have magic horseshoes rammed up their asses, it is looking like I will be denied a lifelong dream to attend a World Series game this year. Down 0-2, the Orioles are pitching poorly and not looking like a worthy World Series contender. I almost didn't write a blog post, but I thought better of it and decided to write about something that I learned a couple weeks ago that I thought was really cool. I went back to my hometown for my birthday because my mom had bought tickets for the Panther game. Since the game was on a Sunday, of course, and that being my actual birthday, I figured spending the weekend back home would be nice. That Saturday evening, when dinner plans were being discussed, my mom suggested that we invite my grandmother to dinner. I gave Grandma a call and asked her what her plans were she said "Oh, I just bought a rotisserie chicken from the store, I might heat that up." So I asked her if she would like to go to dinner with us and she jumped at the chance. At dinner, we chatted away, and I learned a few things about Grandma that I didn't really know, like that she did some post graduate study at Columbia University and that she did some substitute teaching at Princeton. What I found out when my wife and I dropped her off at her house blew all of that other stuff out of the water, though (for me at least). We had decided to hang around and visit for a while and the subject of sports came up. Grandma likes to joke that she has no idea which team I follow, because it is painfully obvious to anyone who knows me that I follow the Orioles. I made a comment that it would be really nice if the Orioles would make it to the World Series, because it has been a dream of mine to attend one. That's when Grandma dropped a little nugget of information on me that I never even thought of before. She said "Oh, I've been to a World Series game." "What? Really?" I said as my wife laughs at the sight of my with my jaw on the floor. "Oh yeah, I'm pretty sure it was the 1949 World Series. I was working on Wall Street and my boss had extra tickets he wasn't going to use, so he gave them to a girlfriend and I." I thought this was so cool, I asked her about the game, but she said that she wasn't really into baseball, so she and her friend chatted the whole time. She didn't remember the players she saw, but she did remember that it was the Yankees vs. Dodgers and she remembers that she saw the game in Brooklyn. Wow, Ebbetts Field!! I asked Grandma if she still had the ticket from the game, which made her laugh (because she knew why I had asked). She said "Oh, of course not, it's long gone!" Dang! When I got back home, I did a little research, and sent a couple emails back and forth to Grandma, trying to pin down the game she saw, if I could. From what she remembers, she was let out of work to see the game and she didn't usually work on the weekends, so based on how the World Series played out, she must have seen the Friday, October 7, 1949 game (Game 3 of that World Series). The first two games were played in the Bronx at Yankee Stadium with the series moving to legendary Ebbetts Field for the Friday game. The series was tied 1-1 with the Yankees winning Game 1, 1-0 and the Dodgers winning Game 2, 1-0. Grandma got to see a thrilling Game 3 where the game was tied going into the 9th inning, 1-1, and the Yankees would score 3 runs in the top of the inning to make it 4-1. The Dodgers would score 2 runs in the bottom half to make it interesting, but the Yankees wound up winning 4-3. Sounds like a really cool game to see. The Yankees would go on to win that World Series 4-1. I thought it was so cool that my grandma had been to a World Series game, and a historic one, at that. I'm no Yankees fan, but I wouldn't mind a trip back in time in the DeLorean to see one of those games. That would be pretty awesome. 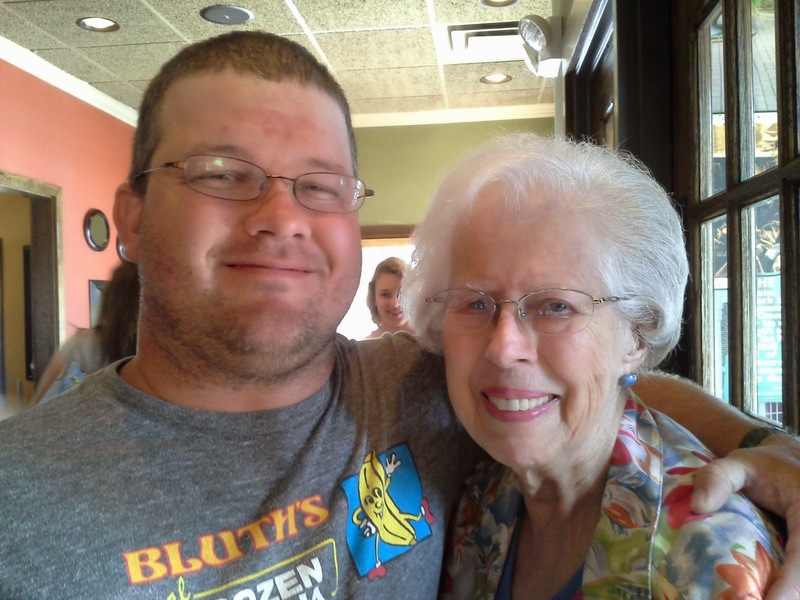 I'm really glad that I sat down to write this out, because years from now, I'll be able to look back at this post and remember this baseball conversation I had with my grandmother that was completely out of the blue. I really never even had thought to ask her about any sports experiences that she had in her life, which, looking back, I wish I had done sooner. It really never even occurred to me to ask. I wish more people would take the time to just sit down and listen to the stories that their elders had to say, because you might be surprised at what you might find out. I was! I'm beginning to see a light at the end of the tunnel. What was once a huge stack of "to be blogged" cards on my desk is now a small pile of cards that should be taken care of by the beginning of next week. Things have calmed down here, card wise, since I have been working on saving some money, just in case the Orioles make it to the World Series. I also was not able to spend as much on cards earlier this month, due to picking up tickets to ALDS game 2. On top of that, I haven't had any time to go through my boxes to find suitable trade bait for some folks, and that has severely limited my ability to send out packages these last few weeks. Slowly, I have had a few care packages come in from some of my buddies that I have made on Instagram. Some others have removed themselves from 'free card' consideration by taking the care packages I have sent them and fading away rather fast. One of the guys who has stuck around after several care packages, and has become a friend is Anders from Minnesota. He's a good guy whom I have been helping by sending supplies his way, since his LCS is something like 100+ miles away. Ouch. Anders sent me a surprise package a week or so ago that had a couple Orioles cards that he was able to dig up. 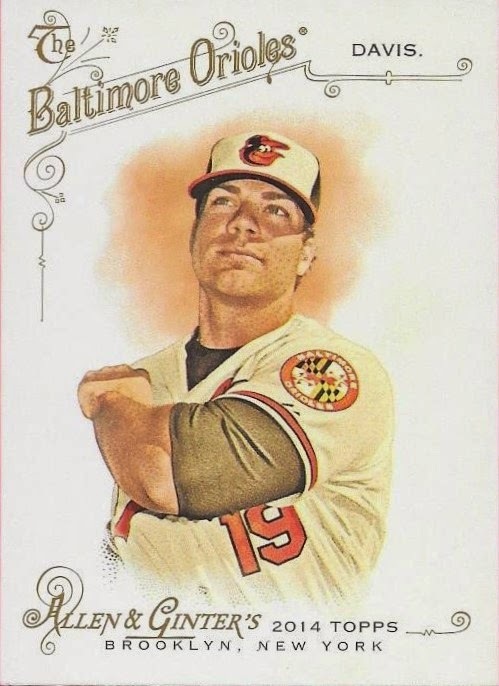 One of them was the nice 2014 Allen & Ginter Chris Davis that you see above. I appreciate the care package and the note that was sent along with it. Sometimes, really, the notes are my favorite part of the package. Now, it's time to gear up for Game 1 of the ALCS. Which means, I won't have time tonight to go through boxes, either. Dang. This is a good problem to have, though. Go Orioles! I got a nice surprise package in the mail the other day from my little buddy, Carson, whom I trade with regularly on Instagram and Kik Messenger. Carson sent me several Orioles cards and included this sweet Brooks Robinson 1959 Topps card that he meant to send in my birthday package. 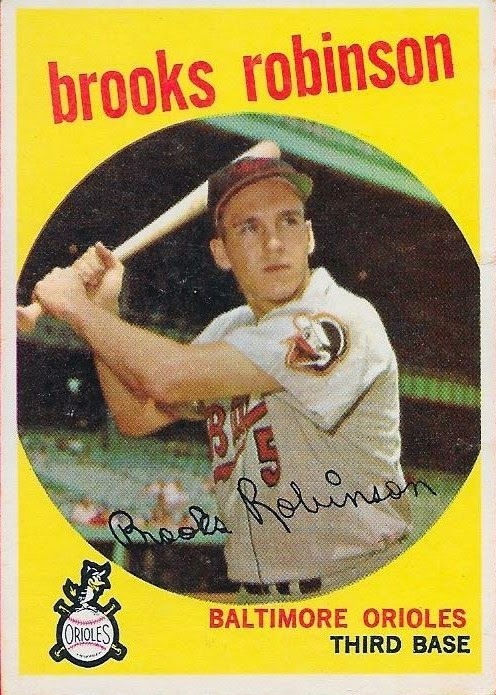 I already had this card in my Brooks PC and my 1959 set, but one more version definitely doesn't hurt. I was happy that he thought to send it to me. Thanks for the package, Carson, as always, I appreciate the cards you, your brother and your dad send me. I know we will be trading again, once I find some suitable cards for the three of you. I completed a trade over Instagram last week when I met a young man named Drew, who's screen name is ultimatecards_. He is a big Yankees fan and wanted a few of the cards I had posted on my account, namely my 2009 manufactured letter patch of Mickey Mantle. Drew initially contacted me by telling me that he was willing to deal all of the Manny Machado relics that he had hoarded and wanted to begin our talks by seeing if I had any rookie cards of some of today's stars. Then he saw the Mantle and things escalated from there. I sent Drew the Mantle, my graded 10 Yasiel Puig RC, scores of recent rookie cards, two Derek Jeter "rookies", and topped it off with my Manny Machado signed baseball that I had just recently had returned from a 12-year old scammer. 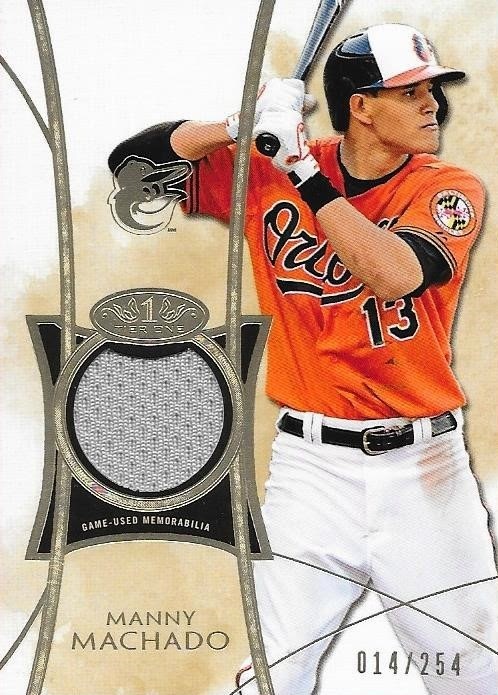 In total, Drew sent me 10 Machado relics (one of which was an auto/relic, featured at the top of this post, and three of the 2014 Topps Trajectory relics). 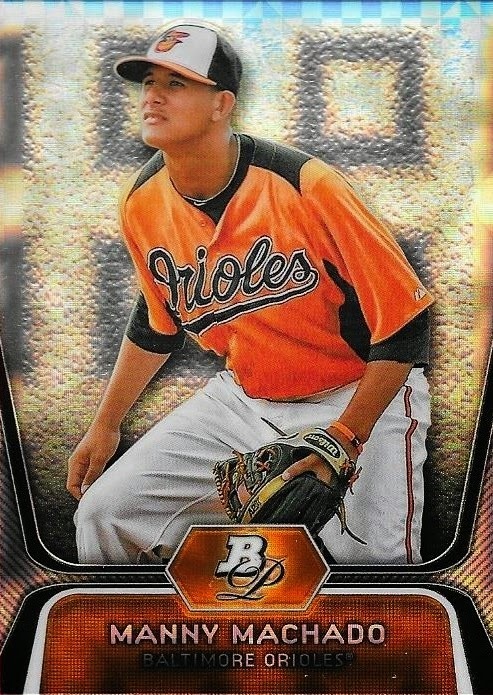 He also included some numbered Machado parallels and a bunch of Orioles cards. Not to mention, Drew included a few Giants cards for my son, Chris. Some of the cards I already had, like the above All Star Stitches card, but I was happy to get it anyway. One of my favorite non-relic cards in the deal was this 2014 Bowman Red Ice parallel numbered 16/25. Most of the relic cards were numbered, and it surprises me that Drew was so eager to send them my way. He got a great haul in return, but too many people I've dealt with would have overpriced all of these cards. I was happy that each of us got everything we wanted in the deal and there was no haggling back and forth. This Bowman relic was a card I already had, but I really like how it looks, so I was glad to take in another one during this deal. I also had gotten one of these 2011 Goodwin Champion relics from my buddy, Max. Both of them have dirt on them, which I find to be really cool. I'll probably store the two of these cards side by side. I hadn't seen one of these Panini Black Friday cards before and was happy to get one in this deal. It is hard to see, but this one is numbered 94/99. 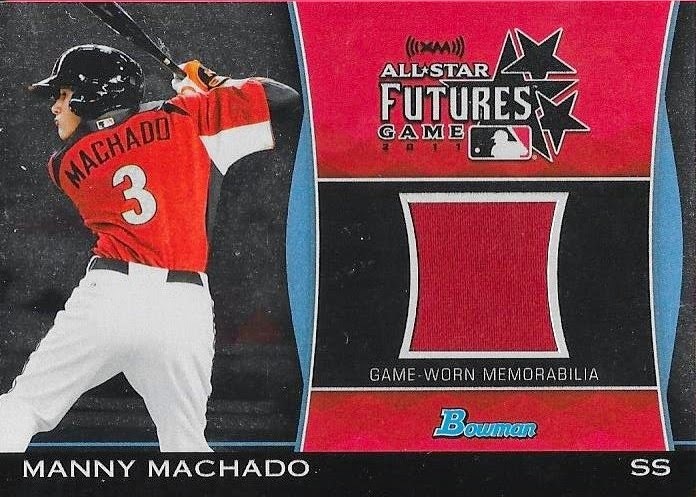 I think this jersey must have been from a Futures Game jersey, much like the Bowman relic shown before it. 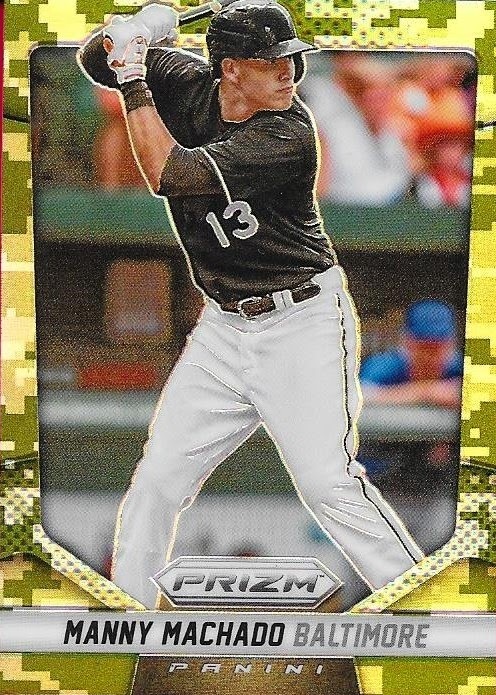 One of my favorite parallels that I have seen is this 2014 Panini Prizm camo parallel. Panini does a good job with their Prizm product and the colored parallels really look sharp. This one isn't numbered, but that doeasn't take anything away from this card. I was really impressed with Drew, so much so, that we have already been working on another trade. We have been chatting pretty much daily, so I'm glad that we used this trade to get to know each other and build a trust relationship. Thanks for the trade, Drew, I really appreciate it! 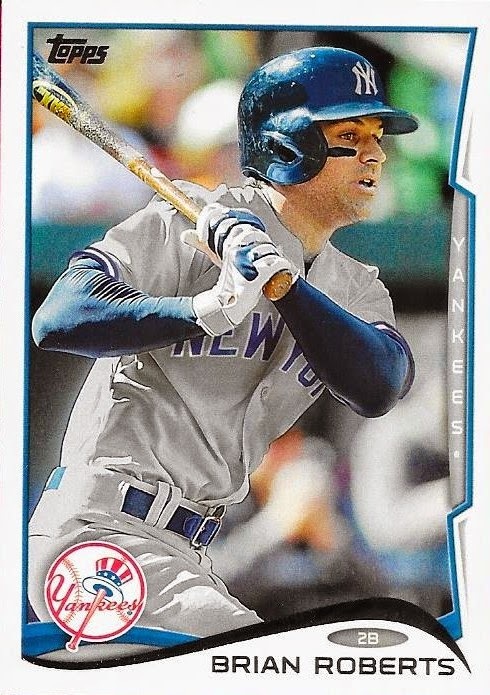 I completed a trade with a kid named Emperor (I'm not kidding) on Instagram last week when I sent him a Troy Tulowitzki 1989 design refractor from 2014 Topps Chrome. 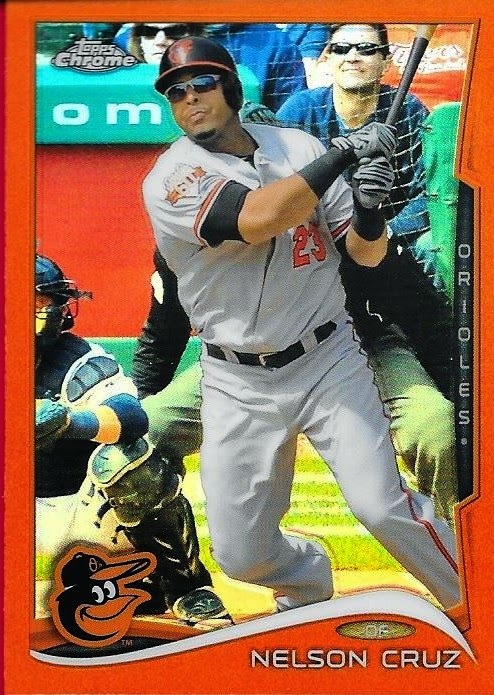 In return, he sent me this orange refractor of Nelson Cruz. Not a bad deal. 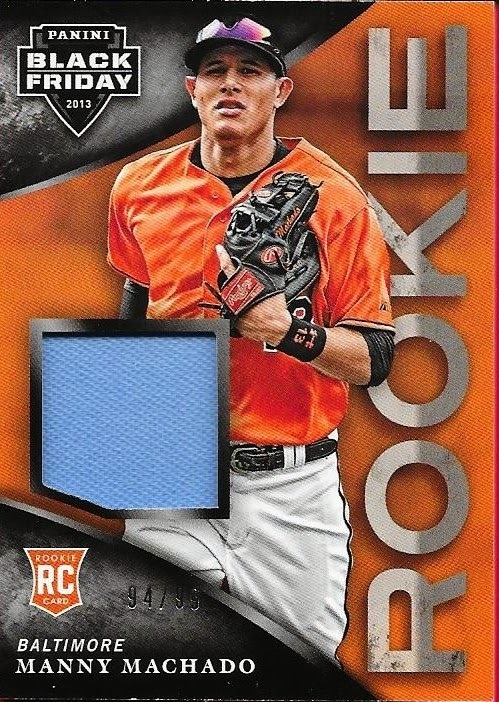 I enjoy the orange parallels of Orioles because it fits so well. 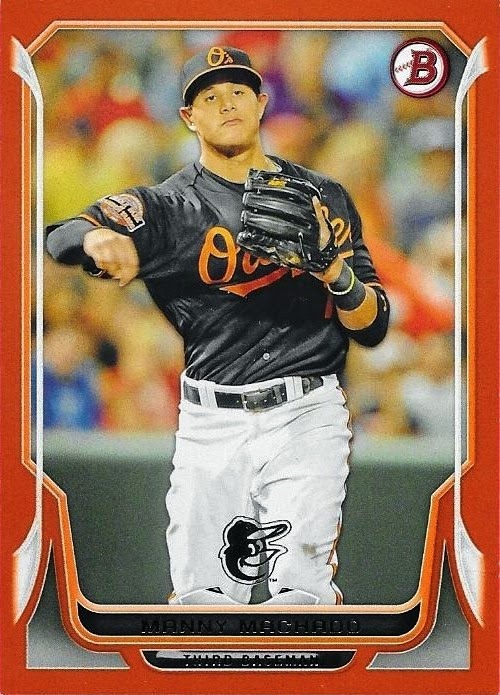 I haven't really been pursuing Cruz cards much because I fear that he is going to be a one and done signing for the O's. He really has helped the team this year, and I hope his bat remains hot as the O's march toward the World Series. Thanks for the trade, Emperor. I really appreciate it, and I hope I can send more Tulos your way soon. I got another huge package in the mail the other day from my very good friend, Max, that was packed full of Orioles stuff and a few other odds and ends. This package was a result of a trade we worked on which landed him a 2013 Topps Mini Jake Arrieta printing plate. Since Arrieta is no longer an Oriole, I sent the plate to Max and he hooked me up with some really nice stuff. 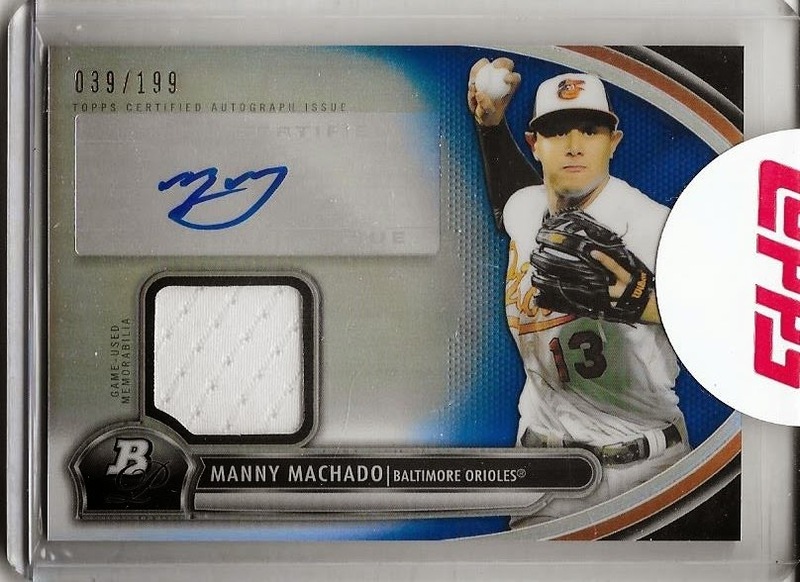 The above 2011 UD Goodwin Chapions Manny Machado relic was the cornerstone of Max's end of the deal. If you look closely at the relic, you can see some dirt on it. One of the oddball cards Max threw in, because he knows I like Hall of Famers, was this 1959 Fleer Ted Williams card. I know next to nothing about this set, but I thought the card looked really cool, so I was happy he put it in the deal. 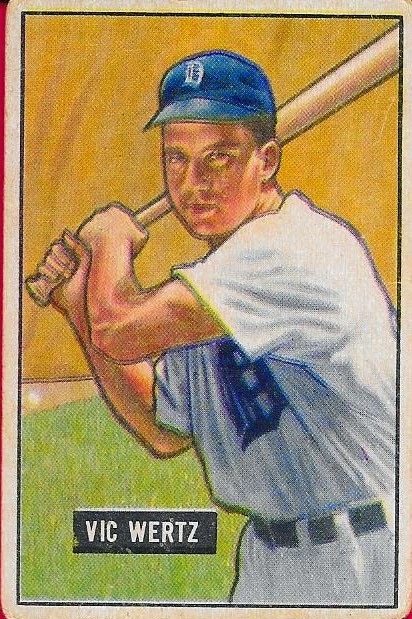 Another nice card he sent along was this 1951 Bowman Vic Wertz. 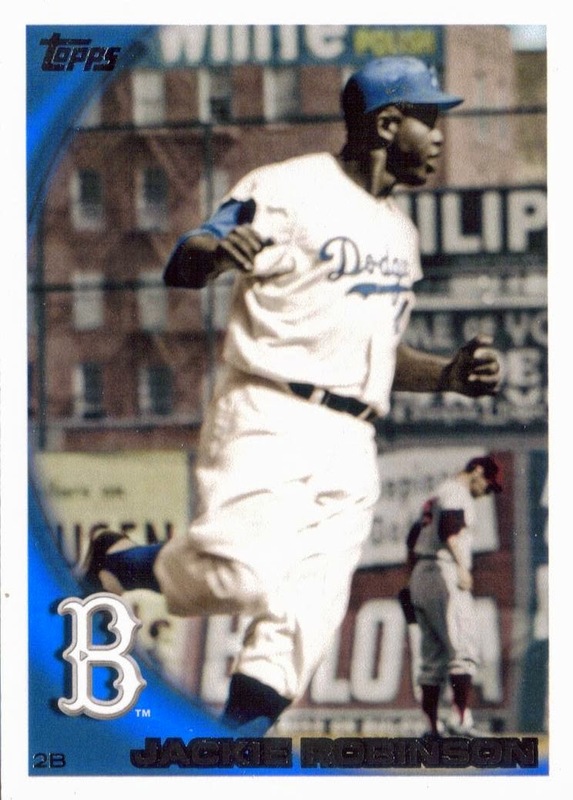 I have a couple '51 Bowmans and would consider doing the set, except that there is a key rookie card in there that would take me forever to get, the Willie Mays. There is also a Mantle that is his true rookie, but it doesn't carry the price tag that his '52 Topps carries. I was so glad to continue to deal with Max. We have gone beyond just trading by now and talk to each other regularly as friends. I've advised him on some cards and we chat once a week over Skype. He's just about the friendliest person I have met over Instagram, and even at his young age, one of the most knowledgeable. I really wish more of the kids on Instagram could take the lead from him and conduct business the way he does. Thanks for another great package, Max, as always, it is definitely appreciated. 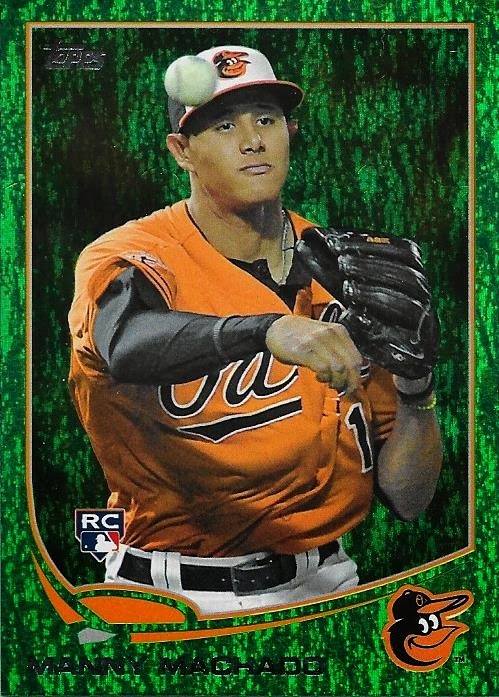 I completed a trade last week with a guy named Adam on Instagram when I sent him a Matt Davidson auto out of 2014 Chrome in exchange for this 2013 Topps Manny Machado emerald parallel. I've been trying to get the Manny for a while now for both my PC and my emerald set, and I was finally able to match up with someone who had one. I am still working on the emerald set, even though things have slowed on it quite a bit. I knew the Manny would be tough to find, so I'm glad I was able to get it out of the way. I'll probably start chipping away at the set on Sportlots now, since fewer and fewer people are going to have them laying around.